As most of you will now know following the Newsflash email sent out on Tuesday evening, I was very proud to announce that we have been selected as finalists in the EU Commission Broadband Awards 2018. You can read all about it on the following link…. Without any one of these contributors we could not have achieved resounding success that this project is achieving. Carina and Jim Dunk are representing Myfi in Brussels at the Awards Ceremony on 19th and 20th November, when we will find out who the winner of each category is. All the five winners of the categories are expected to give a 5-minute presentation at the Broadband Day Conference. inform us we were a finalist. It is very interesting that we are still getting some additional householders within the village signing up and completing UVC and ABC grant forms. Amazing to think that at the outset we had just over 70 applications and now we are looking at a total of over 200. 1 Gbps FttP has become very popular over the past 12 months.! And everyone who is connected is benefitting in lots of ways. Grant money continues to be paid into our bank account which is looking healthy and we are now able to build up the buffer required for repayment of investors. Over the past 3 weeks, the trenching has been completed at The Hollies, Penygroes, Crosconeinon and Haygrove. Last weekend was very successful; trenching around Haygrove and nearby properties, digging the Chamber in, putting in the splice bullet, blowing fibre to the 12 nearby properties, splicing the fibres into the Splice Bullet, Splicing the other ends at The Hub and “Patching into the server” and splicing pigtails and installing 2 routers ! ! ! What a MARATHON ! ! it is amazing what a group of people can achieve when they put their minds to it. A very satisfying and rewarding weekend ending with a drink or two at our local ! Phil Middleton did an excellent job with his Hi Vis vest and traffic control and Chris Jones kept us all supplied with endless tea, coffee and welsh cakes. I couldn’t resist taking along some raisin, pine nut and cognac truffles that I had made the night before! 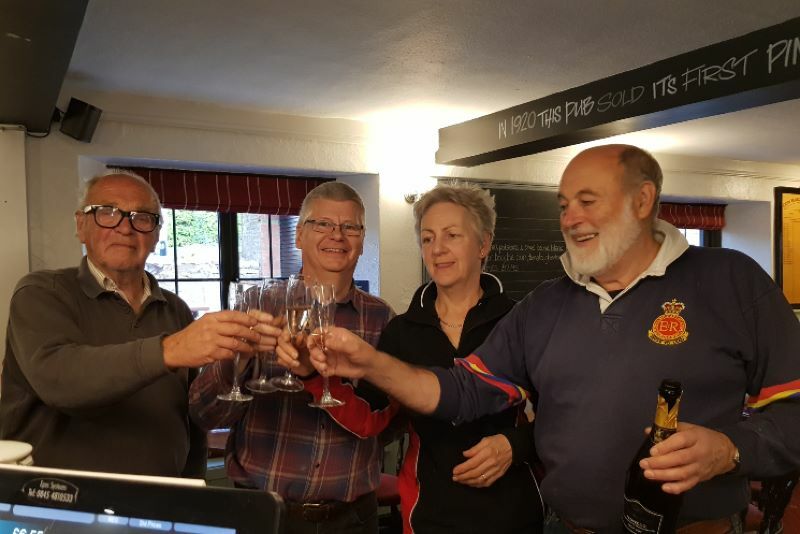 they went down very well…………..
Glyn and Jim can see light at the end of the tunnel and now the total number of FTU’s fitted number 150. They are pitching in and helping to blow fibres into properties in between the FTU fitting ~ beats standing around twiddling their thumbs. What a manic 3 weeks, with the weather being so glorious, I wanted to complete all the splicing in the outside chambers and so set myself a target to get all these done as the forecast was to get colder by the end of this week ! I am quite happy to be running in and out of houses to pigtail and fit routers but sitting outside in a chamber has less of an appeal in the cold. I managed to achieve 60 splices in one day ! ! surprising even myself ~ must be all the practice ! getting even more efficient. 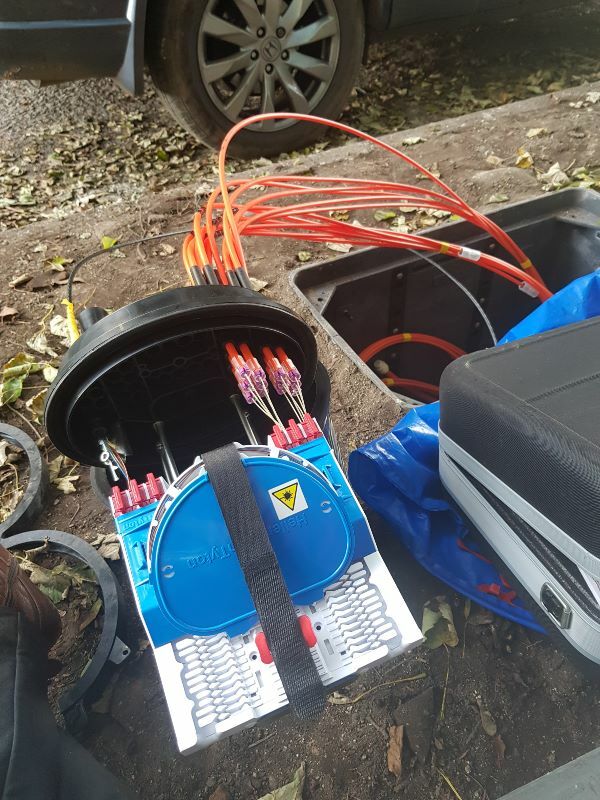 Over the past three weeks we have seen 120 splices completed in chambers, splice bullets installed in Haygrove and Penygroes, 36 connections in The Hub giving a total of 141 live connections to date. routers and pigtails which we managed to get 2 completed the very same day ! All major fibre has been blown ! Another tick in the box for tasks completed ! with just twin fibres left to blow which will see a further 21 connections over the next 5 days. 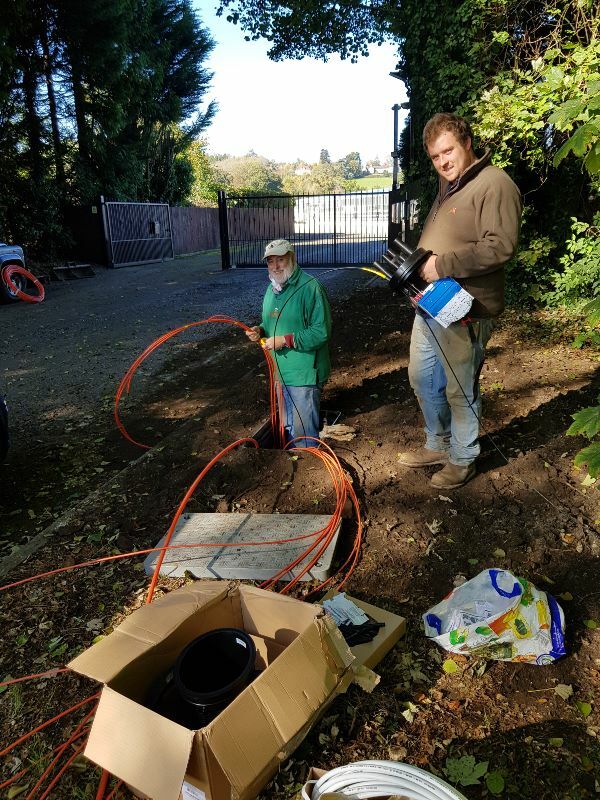 A huge thank you to all volunteers who continue to make themselves available as we need them and ensures that we continue to make good progress with achieving the aim of completing all possible connections by the first week of November. We have not forgotten the remaining properties at Cefn Mably Park. They are proving to be the toughest challenge, but these will be overcome and they will get their connections. All the associated work will continue to complete the connection to approximately 45 properties over the next couple of weeks before the weather rolls into winter and it becomes too cold, wet and difficult. Now that we have many connections it is probably a good time to inform everyone regarding what to do if your internet goes down or you lose your connection. Go to our Helpdesk to raise a support ticket. Raise a support ticket by emailing support@myfi.wales. Viruses, worms and the like often perform malicious tasks such as deleting files, accessing personal data or using your computer to attack other computers. Some collect information, while others install malicious software otherwise known as malware or spyware. We all need an anti-virus software in every computer system to protect it from unknown viruses, spyware and other cyber threats. To help keep your computer healthy, you should install an Anti-Virus software. You should also ensure that the software is kept up to date regularly with the latest updates. If you haven’t already done so, it would be an excellent idea to organise some Anti-Virus software on your PC / laptop / Phone / Tablets etc. There are several basic software packages that are free of charge e.g. AVG which will give you basic protection, and for a reasonable cost you can get the full package that will cover unlimited devices for a 2-year period. Should you get a virus / trojan or similar it will be picked up by Hub Network Services and action will be having to be taken to reduce your bandwidth and so prevent others from losing their bandwidth due to a trojan or virus. If you remember back in the summer, we had to carry out some repairs to the Hub roof due to some minor leaks. Before the winter sets in, it has been decided that we should eliminate any further risks of any more leaks to the roof of the Hub to safeguard our precious equipment. Glyn and Jim have taken the time to meet with 3 contractors ~ one locally, obtaining quotes to put a GRP roof on top of the existing roof with a guarantee against water ingress. Three quotes are now on the table, a budget has been agreed by the Directors and a choice will be made to select the appropriate contractor in the next few days. At the Harvest Festival in St Michaels Church, it was wonderful to see the church full. It was a lovely service with several references to the MyFi Internet Service and how it has benefitted the whole community. Afterwards a special lunch was served which was thoroughly enjoyed by all. I am getting a steady flow of Customer Feedback Forms being returned to me and am in the process of adding Customer comments on the /website. We are considering a further event for VoIP ~ (Voice over Internet Protocol) telephone systems, Net Mesh Technology (for extending your Wifi throughout your house with constant connection) and a PC Specialist to answer your general computer issues. If anyone is interested, please email brinley.richards@myfi.wales so that he can establish whether there is enough interest to set up an event. The date of the next meeting is Thursday 22nd November 2018 at 7.30 P.M. PLEASE NOTE: The next meeting is in 4 weeks’ time. As work and activities complete there is less of a need to the need to catch up on a fortnightly basis. PLEASE COME ALONG AND HEAR ABOUT THE LATEST PROGRESS AND ASK QUESTIONS. EVERYONE IS WELCOME. Please use this form to register your interest, find out more or let us know that you do not wish to be connected.